While the Expert Award Concave WAS given away as a prize at some contest of the era, it was also available for sale as part of Duncan's lineup of that era. So this really should be categorized as a Production AND Award yo-yo. 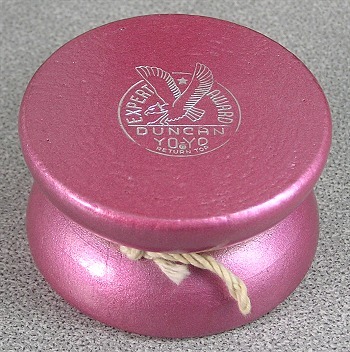 A jazzed up version of Duncan's classic concave, the Expert featured fancy paint jobs, like this magenta metallic finish, and the Expert Award logo with eagle.